Ultralife Corporation has launched new CR123A battery products, particularly created for wireless security and home automation markets. The batteries, supporting some portable and wireless applications, will offer some of the highest performance of its type in the industry. 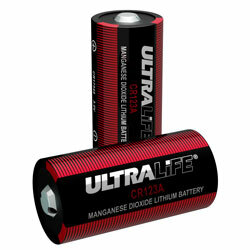 Several Ultralife CR123A models are available to fit various applications. The CR123A, CR17335, CR17335-10 and CR17335SE, manufactured in China to supply the European and Asian markets, are offered in either a 1500mAh or 1800mAh capacity. “CR123A batteries were initially developed for SLR cameras but are increasingly finding use in wireless security and home automation applications,” explained John Diggory, product general manager 9V/3V of Ultralife Corporation. “The wireless security and home automation market is expected to reach $32 billion in 2022 and will reach more than 50% of homes in the United States.